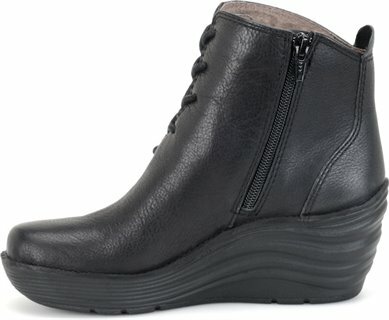 Very bouncy and comfortable for being on my feet all day. Good support with a little height. Very comfortable and stylist shoe. I love these boots! 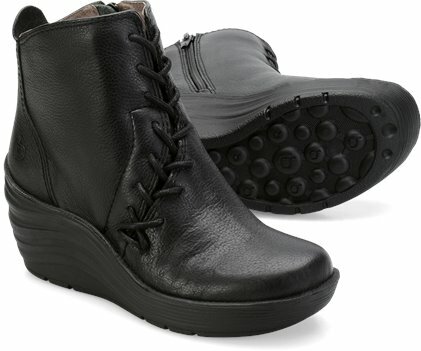 The style is very funky and the brand works great for my bad feet. They are very well made of top quality materials. I went up a 1/2 size to alleviate pressure on the inside lace as it was pushing on my foot. I have a slim foot. I was surprised this was a problem for me. I usually have issues with shoes being too wide. Going up a half size allowed me to put a nice comfy insert or my orthodic in with no pressure from the inside lace. Now they are super comfy. Doesn't feel like I am walking on a 2 inch heel. I can wear them all day with no pain to my feet or my bad knee. First heel I have been able to wear in years! I even purchased a pair for my 13 year old daughter to wear to a winter event. She wanted a heel to dress up her outfit but needs to be able to sustain them all day. This willl do the trick! Just got em today. Looks great and feels wonderful, it has a memory foam type insert. The laces are not just decorative, so you can adjust them a bit, and tuck them into the boot to maintain the sharp styling. I think I am going to buy another pair. Very happy on day one. These boots are adorable. The teal color is really more of a bright spruce green, but goes great with anything in the teal family, so no complaints. The asymmetrical laces make them stand out. They are light as air and lovely to walk in. I walk a 3 mile round trip to work, and wearing these boots feels no different from wearing running shoes. They run a bit small; my usual size is 8.5/39, and the 40 I ordered fit perfectly over medium-weight socks. My feet are on the narrow side, and there is no extra room in the width, so if you have wide feet, order up or look for a different style. Overall, I recommend them highly.